Harper reacts to a called strike three. This was to be the year of Trout and Harper, Harper and Trout, wonderkind rookies primed to change the face of baseball—and in late spring and early summer, it was. It’s still the year of Mike Trout, of course. Bryce Harper, though: not so much. His high-water mark was a .307 batting average on June 12; three games later he went 0-for-7 against the Yankees, with five strikeouts, and has hit .210 over the 49 games since, with only three homers. Since the All-Star break, he’s batting .176. Harper has been baseball’s most touted prospect since he was 16 years old, and now, for what may be the first time in his life, he’s scuffling in a significant way. In the fourth inning of Wednesday’s game against the Astros, he took a two-strike pitch, low and outside from Armando Galarraga—“catcher Carlos Corporan’s mitt nearly scraped the dirt,” reported the Washington Post—so certain it was a ball that he stepped back into the box. Plate ump Angel Hernandez called it strike three. Harper got into Hernandez’s face, shouting and pointing, and had to be physically removed by first base coach Trent Jewett. It was a reaction borne of frustration, likely as much about Harper’s own struggles as Hernandez’s strike zone. The ump didn’t come close to ejecting the rookie (“Let him have his say—nothing wrong with that,” Hernandez told a pool reporter after the game) but it’s possible that the display affected his outlook toward Harper’s ensuing at-bats. 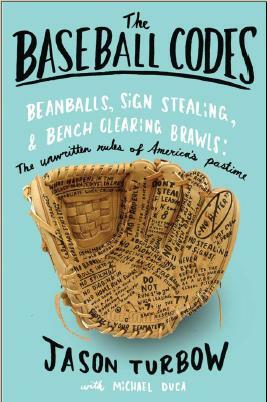 Umpires vociferously reject the notion that they ever test rookies in creative ways—denying them close calls as a means of putting them into their place, letting them know from the get-go who holds the power on a baseball diamond—but their ranks have long been accused of doing exactly that. Former catcher Randy Knorr tells a story about Wade Miller’s first major league start, with the Houston Astros in 1999. He was struggling against the Arizona Diamondbacks, and plate umpire Rich Rieker wasn’t giving him any close calls. Miller was 22 years old, and was becoming increasingly frustrated at his inability to get a break from Rieker. In the sixth inning Wednesday, when Hernandez called a strike against Harper on another low, outside pitch—which would have been ball four from reliever Xavier Cedeno—it smacked of a similar type of rookie baiting. 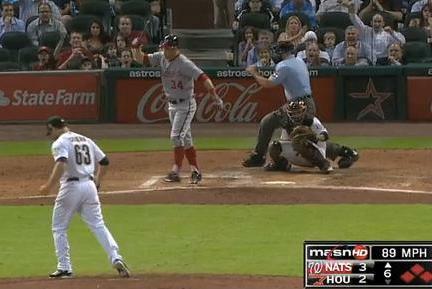 Harper had showed up the ump in the fourth by so publicly questioning his strike zone. This time the bases were loaded, and Harper had already started jogging to first; when he heard Hernandez’s strike call, he was sufficiently disbelieving as to take a few more steps. Harper cocked his bat with one hand, as if he was going to throw it, then restrained himself. He chucked his helmet and tossed his bat, and as he ripped his batting gloves off in the middle of the diamond he shook his head. La Roche, a 9-year vet, has seen this kind of thing before. Without saying as much, he made it obvious that he felt like he recognized exactly what was going on. The Post cited FanGraphs.com stats showing that only 40 percent of the pitches Harper has seen since the All-Star break have been in the strike zone (27th lowest in the majors), and he’s swung and missed at fewer than 30 percent of those (and at 8.5 percent of his pitches overall). These are good numbers, not usually aligned with a guy who’s striking out more than 22 percent of the time. An umpiring conspiracy to deliver some humility to the guy who wore gold cleats in the All-Star Game as a teenager? A longshot, at best. But the notion that individual umps view Harper just a bit differently than they do other players around the league is not so far-fetched, especially considering the media hype that followed him through the first half of the season. Knowing one’s place in the baseball hierarchy has always been of vital importance to many of those involved in the game, and umpires are no exception. If such calls are indeed intentional, each is only a small factor in putting Harper in his place. Cumulatively, however, they’re having an effect. Whether or not they’re just, there’s little doubt that the lessons Harper is learning today will be of use later in his career. Previous postReds Push Pirates, Pirates Bide Their Time. Slugfest in the NL Central, Anyone? Mike Trout doesn’t seem to be having this kind of trouble. We all know umps make a lot of bad calls but it seems clear to me Harper is going through the growing pains most young players do. His are just at the MLB level. You could well be right. Still, Trout doesn’t carry quite the reputation for flash (no SI cover as a high schooler; no $10 million, Scott Boras-driven contract; normal-colored cleats). Who knows if any of that makes a difference? Of course they’re baiting the kid…AND he’s scuffling.It’s the “perfect storm”.